With household names such as Michelangelo, Caravaggio, and Tiepolo dominating museums, it would be easy to believe there were no women artists working in Italy during similar time periods. Though they faced more challenges than their male counterparts, women artists held a strong presence in early Italian art. Elisabetta Sirani and Diana Mantuana (also known as Diana Ghisi, Diana Mantovana, or Diana Scultori) are two women who had successful careers as artists. Sirani (1638–1665) was a Baroque painter and engraver from Bologna. Considered a prodigy, she created more than 200 works of her art during her short life. Mantuana (c. 1535–c. 1590), born in Mantua, Italy, was a Mannerist engraver who also had a very productive career. These two women, born nearly 100 years apart, share striking similarities. Both were trained by their fathers—a typical entry point into the arts for women. By the age of 19 Sirani was the breadwinner of her family, supporting her parents and three siblings when her father became too ill to work. Mantuana also proved her business savvy, using her engravings to advertise the architectural work of her husband, thus securing him commissions. Both Sirani and Mantuana made strong statements by signing their works—a rare practice for a woman artist. Because Sirani painted quickly, critics made accusations that her father was lending a hand. In response, Sirani opened her studio to the public to observe her at work. Even Grand Duke Cosimo III de’ Medici came to watch her paint. Mantuana also placed an emphasis on her signature, becoming one of the first women to receive papal privilege. Essentially a copyright granted by the pope, this protected her work from being copied and secured her name to every work that she printed. 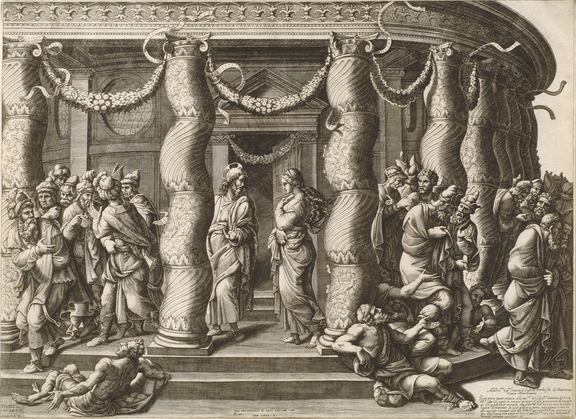 NMWA’s collection contains engravings by both Sirani and Mantuana. Christ and the Woman Taken in Adultery (1575), based on a Raphael tapestry designed for the Sistine Chapel, is one of Mantuana’s most famous prints. In the corner, she dedicated the engraving to Eleonora of Austria and stated her dual allegiance to Rome and Mantua. 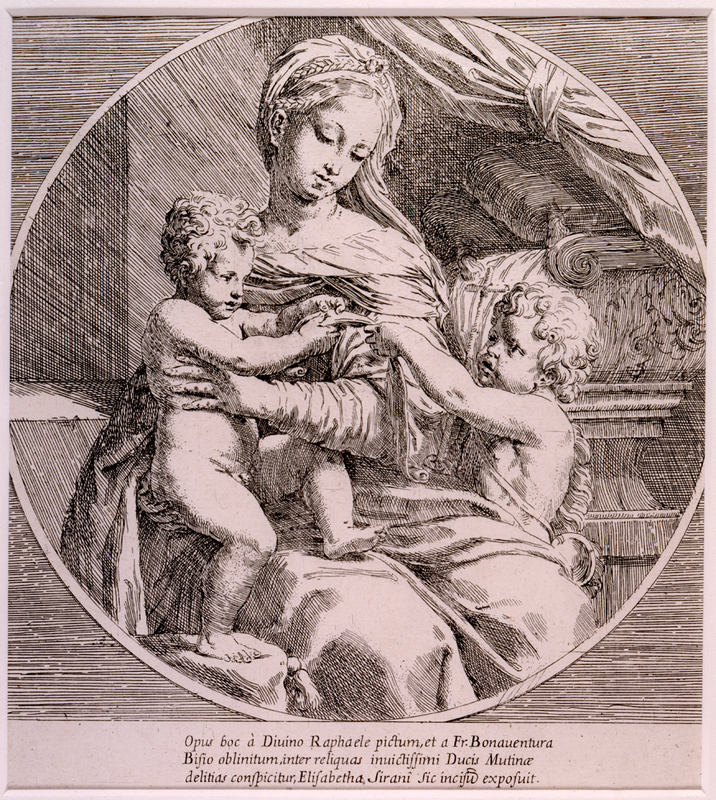 Two engravings by Sirani, The Holy Family with St. Elizabeth and St. John the Baptist and Madonna and Child with St. John the Baptist, are in NMWA’s collection. In the latter engraving, Sirani stated that it was inspired by Raphael, much like Mantuana’s work. Sirani continued to help elevate other women artists, opening what is considered to be the first art school in Europe for women. There she trained her two younger sisters and at least 12 other aspiring women artists. —Chloe Bazlen is the summer 2017 education intern at the National Museum of Women in the Arts.